KIEV, Ukraine — Precious religious iconography, fake malachite furniture and really, really bizarre portraits. 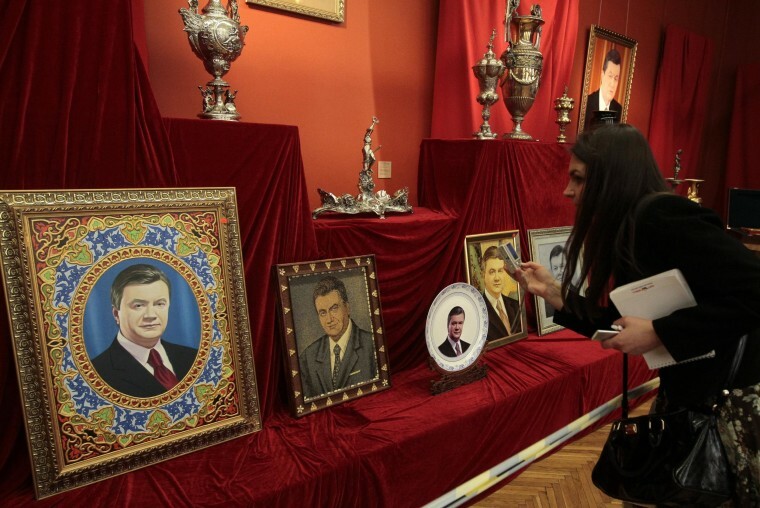 Those are some of the artifacts recovered from ousted Ukrainian President Viktor Yanukovych’s lavish residence after he fled the country in February, now on display at Ukraine’s National Art Museum. Titled the “Mezhyhirya Code” — after the name of the billion-dollar palatial complex on the outskirts of Ukraine’s capital — the new exhibit is aimed at showcasing the peculiar excesses of the disgraced autocrat’s regime. For many ordinary Ukrainians, it also provides a telling — if unsettling — glimpse into the personality of a leader reviled for looting billions and driving his country toward economic collapse. The exhibit brings together a range of artwork and personal effects from Mezhyhirya currently being transferred back to the state after years of murky private ownership under Yanukovych. Spaced out across the museum’s first floor, it’s divided into several sections — or “books” — that contain everything from the ostentatiously ornate to the downright weird. … and a painfully awkward everyman. Short introductions to each section attempt to decipher the meaning behind each group of items. Museum visitors, many getting their first look at where their tax money was probably spent, tried their hand at figuring out just why the ousted autocrat chose to fill his luxury home with tasteless accessories such as garish malachite vases (some of which are allegedly fake). “It says something about his upbringing,” said 60-year-old Larisa Galchenko, referring to Yanukovych’s claims about his hard-knock early years as an orphan in Ukraine’s grim industrial east, where he was later convicted for two separate felonies. Mezhyhirya itself, now known colloquially as a “museum of corruption,” currently serves as a sort of public playground, where Ukrainians enjoy leisurely strolls, picnics and even wedding parties. More enterprising locals do brisk business by renting out bicycles — at around $5 per hour, an affordable necessity in order to see the complex in its entirety — and selling souvenirs near the entrance. Others provide their services as rickshaw chauffeurs ferrying curious locals through the 350-acre compound, which includes a private golf course, zoos with exotic animals and a garage stocked with vintage cars and motorcycles. But the centerpiece is the mammoth Honka clubhouse. Although officials have sealed off all its entrances, visitors can still peek inside. Much of the estate consists of sprawling concrete paths and roads that wind through lush greenery. Then there’s the replica “Galleon,” which served as an exclusive, lurid dining hall for enchanting nights on the waterfront. Visitors have been streaming in since the gates first flew open here after Yanukovych’s ouster. Some come to relax, while others return for repeat visits to guide their friends and relatives through Yanukovych’s former playground. Irina Belavskaya, a middle-aged business owner, spent Wednesday afternoon touring the compound with her father and tallying up her tax dollars.